Pawsome! a BIG congrat's on the WIN!!!!! We just checked out all the winners. Congratulations and well done. Bravo. Have marvellous Monday. Congratulations! How great that you donated your prize to a networks what helps bulldogs. Have a super monday and if your are a finalist next year too, I will vote for you again! Congratulations on your win! And how wonderful that you donated your prizes to the FB rescue. Awesome! We just new you would win!! Congrats!!! You guys rock! Congratulations from Harry and Ralphie in Texas. Congratulations, Lily and Edward! That's awesome! Wow and congratulations! You deserve it, will you be giving out pawtographs? Well we just knew you had to win. 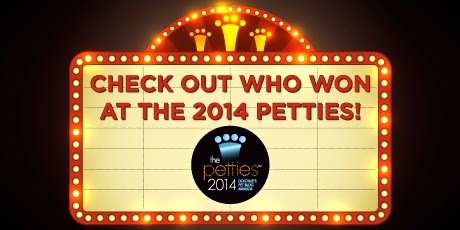 Congratulations on getting the Petties. Hey how bout that! A well-deserved recognition. Boy! Do you ever deserve this! The most creative blog I have ever read. Big hugs from Skoog Farm. Wow - that is just wonderful and very impressive!!! How kind of you to donate your winnings - we know that rescue is very appreciative. That is SO awesome, congrats! It's really nice of you to donate your goodies to help other Frenchies! Congrats! I'm not surprised; you guys are awesome, it's well deserved. Congrats! A well deserved award and great donation to FBRN. How generous of you to donate your winnings! We hope Lily can remain out of pain and surgery-free. Congrats, wonderful news! I see your header is finished - nice! Also, I couldn't leave a comment about Lily on the MRI post, thinking of her and hoping all will be OK.